First established in the Northern Song Dynasty (1035 CE), the Confucian Temple has continually been one of the most important institutes for higher studies in the country. 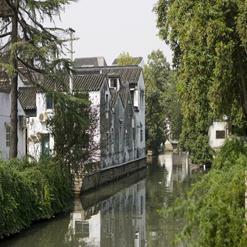 Much of its ground today is still occupied by Suzhou Middle School. Flanked by trees of hundreds of years of age, impressive portrait of Confucius made of lacquer, and various ceremonial instruments.